Microsoft has released its first full iPhone app, Seadragon [iTunes Link]. Seadragon is Microsoft Lab’s technology that lets you quickly pan and zoom a gigapixel image while streaming the content over your connection. Only the section and detail-level of the image you want to see is loaded on your device, making the technology a perfect application for a mobile device with limited bandwidth and memory. The application can load large panoramic and gigapixel images, as well as Photosynth photo libraries. In my brief trial of the app I couldn’t get the Photosynth library listing to load, but you can see a video of it in action at the Microsoft Labs Blog post. 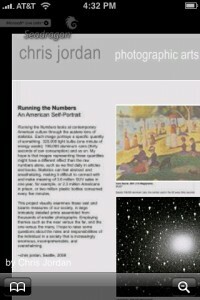 My favorite image in the sample collection so far is “Running the Numbers” by photographer Chris Jordan. You see a classic pointalism painting, but as you zoom in you see that the image is built by hundreds of thousands of aluminum cans, a real great example of the power of Seadragon.